Can governments control the press in the Internet age? Press freedom around the globe declined for the eighth year in a row in 2009, with more than three-quarters of the world's population now living in countries without a free press. It was once thought that new technologies — such as cell phones and the Internet — would help to open up repressive societies. But as fast as reporters in those countries adopt technologies that enable them to connect to the outside world, authoritarian governments like China, Iran and Russia devise sophisticated new tools to control the flow of online information. Meanwhile, dictatorial regimes continue to use heavy-handed, old-school methods to control the world's media, including intimidation and violence. 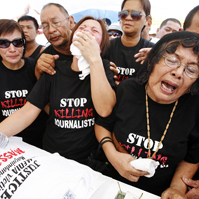 Fifty-two journalists were murdered in 2009, most of them while investigating corruption or politics. Another 136 journalists were jailed — the highest number since 2003 and a 68-percent increase over 2000. Such trends alarm media experts, who say press freedom is a prerequisite for economic development and a harbinger for the future direction of political and social freedoms.